Michael Kors Access Runway smartwatch launched with Wear OS, Snapdragon Wear 2100 SoC and Heart-rate tracking. Michael Kors today announce the return of its iconic Runway watch as an innovative smartwatch-a fresh, eye-catching addition to the popular Michael Kors Access collection. The Runway smartwatch offers a new highly personalized experience with heart-rate tracking, swimproof functionality, payment methods, untethered GPS and more. Equipped for your every need, the Runway smartwatch features new digital dial designs that connect to and visually show your heart rate, making it easy to measure and track. Additionally, updates to the My Social app-a feature that allows users to showcase their Facebook and Instagram photos right on their watch dials-will allow you to customize your social photo dials with Michael Kors-themed stickers. Heart Rate Tracking: Automatically track your heart rate across multiple types of workouts using Google Fit or third-party apps. Swimproof Functionality: Shower and swim (up to 3 ATM) seamlessly and track swim workouts through third-party apps. Payment Technology: Make purchases via your NFC-enabled smartwatch using Google Pay. Google Assistant on the Wrist: Ask the Google Assistant to help you manage daily tasks, get answers on the go and more. 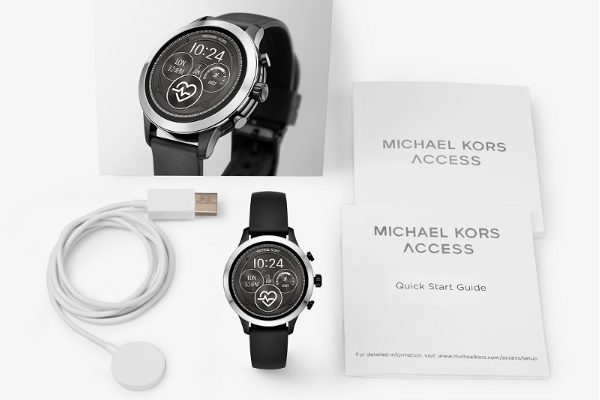 Powered with Wear OS by Google and the Qualcomm Snapdragon Wear 2100 SoC, the new Michael Kors Access Runway touchscreen smartwatch is compatible with both iPhone and Android phones. The Michael Kors Access Runway Fall 2018 Collection will be available at $295 in Michael Kors stores, online at www.michaelkors.com and from selected retailers worldwide in August 2018.